PIC Microcontrollers are small Integrated Circuits (ICs) that can be programmed to control devices such as small robotic vehicles, alarm circuits and they can mimic almost any circuit produced in a school workshop. Many devices in the home use programmable chips including; alarm systems, central heating systems, microwaves and many more. The PIC Microcontroller is reprogrammable using software called LOGICATOR and if a mistake is made while programming it can simply be reprogrammed. Alternatively, a completely new program can replace an existing program already in the PIC Microcontroller. STAGE 2: Once the program has been tested using LOGICATOR on a computer, it can be downloaded to the PROGRAMMER which is attached to the computers ‘comms port’. Any mistakes to the program are usually found during testing on the computer, however, remember - the PIC can be reprogrammed easily. It is not thrown away as it can be reused any number of times. 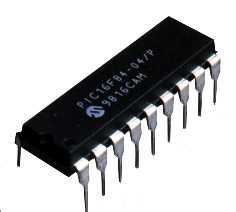 PIC MICROCONTROLLER CHIP: stores the program written with LOGICATOR software. This particular PIC has 18 pins which allows INPUTS and OUTPUTS suitable for school projects. Some of the pins can be programmed to recognise inputs from sensors and some pins will activate output devices such as LEDs and motors. STAGE 3: The PIC Microcontroller (or PIC as it is usually known) is then taken out of the programmer and placed in a project board - which in this case is part of the electronics of a small vehicle with sensors. This vehicles moves around the surface controlled by the downloaded program.